Low-Carb Turkey Soup with Zucchini Noodles is a great way to get back on track after Thanksgiving! Or any time you have leftover turkey or chicken use it to make this delicious Low-Carb, Keto, Low-Glycemic, Gluten-Free, Paleo, and Whole 30 Turkey Soup with Zucchini Noodles. And Happy Thanksgiving everyone! Use the Diet-Type Index to find more recipes like this one. 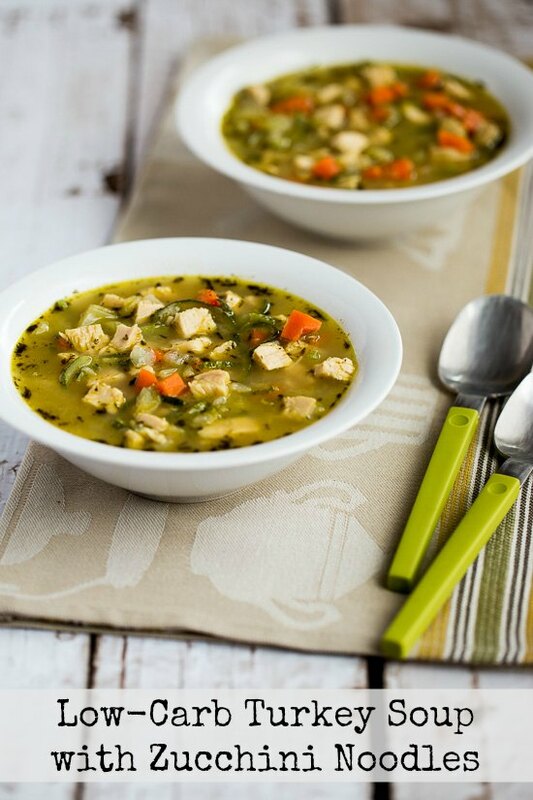 Click here to PIN this tasty soup with turkey and zucchini noodles! Watch the video to see if you’d like to make Low-Carb Turkey Soup with Zucchini Noodles! Tomorrow is Thanksgiving in the U.S., so I hope all my readers who are celebrating will have a wonderful day! And some of you lucky ones are going to have leftover turkey after the big feast is over. Even though I have a huge collection of Deliciously Healthy Leftover Turkey Recipes, it seems like every Thanksgiving I end up creating just one more idea for leftover turkey. This year I’ve been a infatuated with the idea of using zucchini noodles for low-carb soup (like this and this). And doesn’t everyone love turkey noodle soup, so the idea of a lower-carb version with zucchini noodles sounded like a winner. And let me tell you that at the end of a long day of testing recipes when were definitely not that hungry, both Jake and I gobbled up this Low-Carb Turkey Soup with Zucchini Noodles. If you use your turkey carcass and make Homemade Turkey Stock, the soup will be even more amazing, but even if you have to use chicken stock from a can or carton (or water with some Penzey’s Turkey Soup Base), this soup will still taste great. Edit: Low-Carb Turkey Soup with Zucchini Noodles was featured in the Top Ten New Recipes of 2015 (plus Honorable Mentions). Chop up onion, celery, and carrots, then heat the olive oil and saute vegetables in the soup pot with the herbs. Add the turkey or chicken stock and simmer 30 minutes. After 30 minutes, add the chopped turkey to the soup and simmer about 10 minutes more. While the soup cooks, use the Spiralizer or another method to make zucchini noodles to make short thick noodles. We used the medium Spiralizer blade and then cut the noodles into shorter pieces with kitchen scissors. Add the zucchini noodles to the soup and simmer 20 minutes more, or until noodles are as soft as you like them. Season soup to taste with fresh ground black pepper and serve hot. 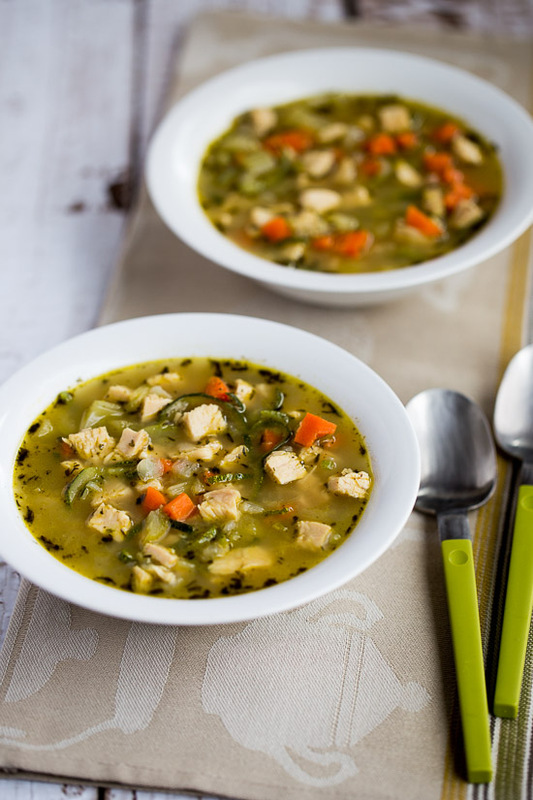 Low-Carb Turkey Soup with Zucchini Noodles is great any time you have leftover turkey or chicken. Chop up the onions, celery, and carrots into small pieces, less than 1/2 inch across. Heat olive oil in the soup pot and saute the veggies for a few minutes, then add the thyme, poultry seasoning, and Spike Seasoning and cook about a minute longer. Add the stock or broth and let the soup start to cook on low heat. Once it comes to a low simmer, cook 30 minutes. 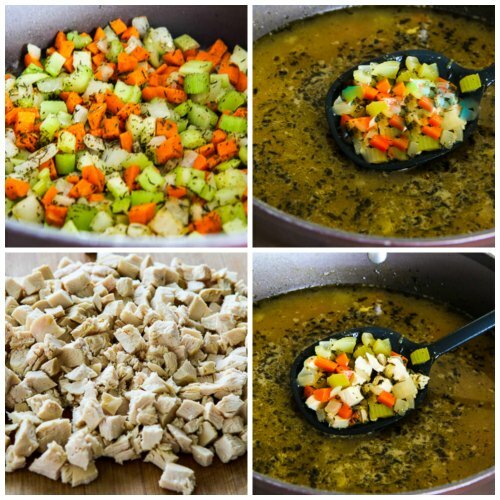 While the soup simmers, cut turkey into small bite-sized pieces. Use a Spiralizer or another method to make zucchini noodles to make short thick noodles. (We used a Spiralizer on the medium blade, cutting a slit halfway through the zucchini lengthwise so we would get short half moon noodles; then we cut noodles into smaller pieces with kitchen scissors. Then add zucchini noodles and simmer 20 minutes more, or until the noodles are as soft as you like them. Season to taste with fresh ground black pepper and serve hot. I use homemade turkey stock, homemade chicken stock , or water with Penzey’s Turkey Soup Base. Recipe adapted from my South Beach Diet Friendly Chicken Noodle Soup with Thyme. 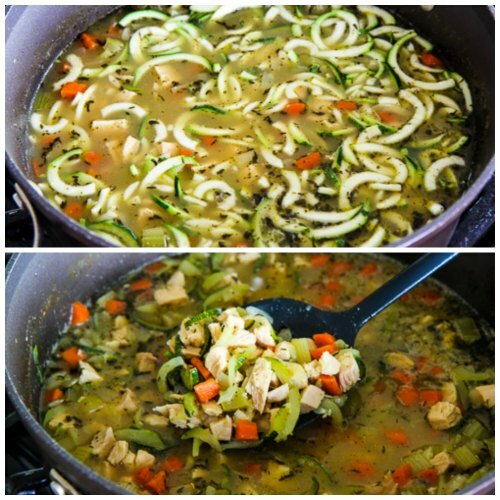 This Low-Carb Turkey Soup with Zucchini Noodles is a great choice for any phase of the South Beach Diet or most other types of Low-Carb eating plans, including Paleo or Whole 30. Use the Diet Type Index to find more recipes suitable for certain diets. Pingback: 150+ paleo thanksgiving recipe roundup for 2017 (links to the best) — PALEO? NO PROBLEM! which I did find in one of the grocery stores in my area. The soup was absolutely wonderful made this way. That sounds like a very smart way to do it, so glad it worked well for you! Time to get out my spiralizing gizmo…..
Amy glad you like it! Celery, carrots, and onions, how can you go wrong. So glad you like the recipe,and the idea of adding flat parsley sounds like a winner. Hope you have a wonderful Thanksgiving. I'll definitely give this recipe a try. We love (both) chicken and turkey soup, but we're always leery of the carb-loaded noodles – since we try to limit our carb intake. I love the idea of making it with zucchini noodles (why didn't I ever think of that?) This soup sounds very tasty, but I'll also add some chopped Italian flat-leaf parsley (w/the chopped stems), since it will impart an incredible amount of flavor and aroma to the soup. Happy Thanksgiving to you and your family, Kalyn! (My bird is already in the oven). Oh my, thank you for catching that mistake! I edited the recipe to say 2-3 cups diced cooked turkey (or chicken). The Spiralizer is pretty great; I keep finding new ways to use it. Sounds delicious. I usually add a bag of frozen mixed vegetables to my turkey or chicken soup. About how much turkey did you use? I wish I had a spiralizer!